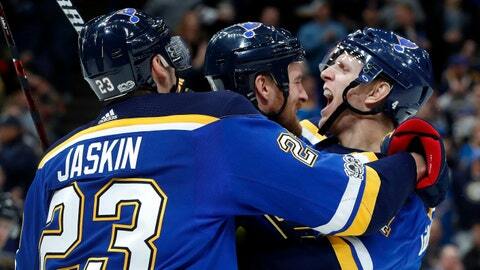 Carl Gunnarsson (far right) scored the game-winner for the St. Louis Blues. ST. LOUIS — Five days after his first child was born, St. Louis Blues defenseman Carl Gunnarsson left the rink with a special present for his daughter. “I’ve got the puck,” Gunnarsson said after scoring the game-winning goal Monday night in a 4-2 victory over the Los Angeles Kings. “It was kind of a scramble puck and just cut to the inside and I saw (Tarasenko). He had a little speed, a little step on the guy, and a great shot by him,” Schwartz said.